Lebanese University’s Dr. Imad Bachir underlines the importance of online journalism. General view of the workshop. Workshop participants represented print and broadcast media. 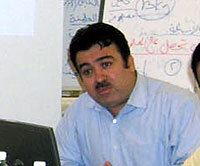 Pollster Jawad Adra provided journalists with story ideas. 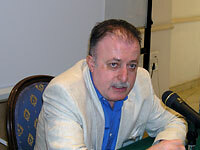 Dr. Mahmoud Tarabay, IPJ’s main trainer. Fourteen reporters and editors from various Lebanese media discussed sources, corruption and journalists’ responsibilities during a week-long workshop in investigative journalism at LAU funded by AMIDEAST and the United States Agency for International Development. The event was tailored to the training needs of selected print and broadcast journalists. 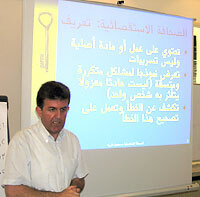 It was organized by the Institute for Professional Journalists August 1–5, 2005 at the university’s Beirut campus. The sessions included investigative journalists’ responsibilities, legal and ethical parameters, story ideas, locating sources, research techniques, using the Internet, and, ways to improve writing style and structure. Participants agreed to work on investigative story projects they had selected and discussed with their colleagues, with a view to seeing them published or broadcast after the workshop, which was conducted in Arabic. Jouranalists from Lebanon’s Future Television, Future Daily, Sada Al Balad Daily, Al-Liwa’ Daily, Al-Hayat-LBC Satellite Channel, Al-Shira’a Magazine and Al Itkissad wal ’Aamaal Magazine were among those who took part. Key trainer Mahmoud Tarabay dealt with the rules of investigative journalism while IPJ director Magda Abu-Fadil tackled the issues of journalistic ethics and the need to differentiate between investigative reports and features. Pollster Jawad Adra discussed investigative story ideas with the journalists, attorney Georges Assaf touched on legal matters and restrictions and Lebanese University professor and director of the First Branch’s Faculty of Information & Documentation Imad Bachir lectured on online journalism.